Just to remember, it's Tuesday, November 7, 2006. It was 07:20 in the morning when we arrived in Abu Dhabi. Of course a bit tired but really looking forward to the adventure. Some money exchange and search for the bus to Abu Dhabi. 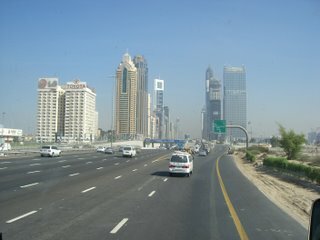 No bus to Abu Dhabi available, one guy said there is even no public transport in Abu Dhabi, very strange. After a Turkish coffee and some water we found a totally toll free Etihad bus to Dubai. With a taxi we went to the hotel, nice and clean place, large room, very helpful people.